The 10th Transgenic Technology meeting (TT2011) will be held at the Trade Winds Island Grand Resort, in St Pete Beach, Florida, USA, on 24-26 October 2011, organized by the International Society for Transgenic Technologies (ISTT). The first deadline for submitting abstracts and applying for the various awards (Registration and Young Investigator Awards) will be due in about one month, on 30th June 2011. Accepted abstracts will be published in the scientific journal Transgenic Research, associated with the ISTT. Results from the various awards will be communicated by 16th July 2011. Please, mark the TT2011 meeting in your agendas and don’t miss this opportunity to discuss the latest developments on Transgenic Technologies, at the International Level, with the world experts in the field. Looking froward to receive your latest work, experiments, designs, developments, your hottest research achievements using genetically modified animals. The International Society for Transgenic Technologies (ISTT) launches today the scheduled 2011 ISTT council elections to renew two seats in the Executive Commitee. Wojtek Auerbach and Boris Jerchow, current ISTT council members, will finish their due services on December 31, 2011. According to ISTT bylaws, elections must be convened during the first half of the year. 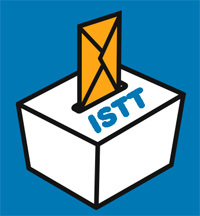 The ISTT Nominations Committee identified three ISTT members willing to accept the nomination as candidates for this election process. Wojtek Auerbach and Boris Jerchow wish to run for their second turn. In addition, Benoît Kanzler, accepted his nomination. Therefore, there will be three candidates for two seats at the ISTT council. These elections will run from May 27 to June 19. Results will be published shortly after that. In order to vote, all ISTT members (except Honorary Members) are kindly requested to visit the member-only area and follow the instructions therein, to use the ISTT electronic voting system. In addition, a referendum for a relevant Society decision will be asked to members as well. Thanks for your participation!. The International Society for Transgenic Technologies (ISTT) is most pleased to publicly announce the renewal of the agreement with the publisher Springer, for mutual cooperation, for an additional period of five years. As part of this agreement, ISTT members will continue benefitting from a privileged access to full online contents of the scientific journal Transgenic Research, to which ISTT is associated, through the members-only area of the ISTT web site. As a new benefit for ISTT members, this current agreement includes a list of books on animal transgenesis and animal genetics, published by Springer, which ISTT members are entitled to purchase with a 33% discount, also through the members-only area of the ISTT web site. Of course, these books by Springer include the forthcoming title on “Advanced Protocols for Animal Transgenesis. An ISTT Manual” edited by Shirley Pease and Thom Saunders, promoted by the ISTT and due to be published in August 2011. The Transgenic Rats common facility of IFR 26, Biogenouest and IBiSA organizes its third meeting in Nantes, France, on June 6, 2011, about Transgenesis and genome analysis. This one-day meeting, co-sponsored by the International Society for Transgenic Technologies (ISTT), aims to provide an update on transgenesis developments in the generation of transgenic animals and in genome analysis. The meeting is chaired by Ignacio Anegon (ISTT member) and organized by Séverine Menoret (ISTT member), Séverine Rémy, Laurent Tesson, Claire Usal and Tuan. H. Nguyen. Deadline for registration is 25 May 2011. ISTT members are entitled to reduced registation fees. The meeting is intended for Master, PhD and medical students with a background in molecular biology and genetics as an introduction to future work in these rapidly developing areas of research. It is also intended for post-docs and scientists already working in certain of these fields and who are interested in expanding their knowledge on the potential applications of these new techniques to their models or in neighbouring pathophysiological models of analysis of genes or diseases using genetically modified animals. Members of Prof. Naomi Nakagata‘s laboratory, at the Division of Reproductive Engineering, Center for Animal Resources & Development (CARD), Kumamoto University, Kumamoto, Japan, have uploaded various very interesting videos, publicly available from YouTube, illustrating several methods and techniques related to in vitro fertilization (IVF) and the cryopreservation of mouse lines, through sperm and embryos. Three new videos on basic cryopreservation techniques have been added to the ISTT collection, available to ISTT members, within the members-only area of the ISTT site. 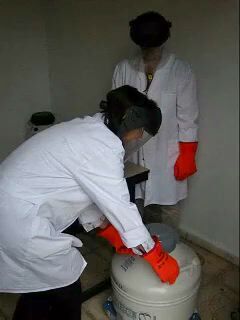 These videos, prepared by Julia Fernández, María Jesús del Hierro and Lluís Montoliu, from the CNB-CSIC, Spanish EMMA node, in Madrid, illustrate the correct access to manually- and automatically-filled liquid nitrogen tanks, depicting standard safety measures to be taken into account when operating in a room with liquid nitrogen tanks. The safety measures illustrated in these videos include: double checking the low-oxygen content red-light alarm (oxygen monitors) before entering the room with the liquid nitrogen tanks, never working alone (at least two people are always visiting the liquid nitrogen containers), protecting your face and eyes with an appropriate plastic shield or glasses, protecting your hands with adequate gloves and, in addition, working fast and without interruptions, thus avoiding to hold the racks or cylinders with cryopreserved samples for an unnecessary amount of time outside the liquid nitrogen. Be always very careful when working with liquid nitrogen and always pay attention to safety rules. Liquid nitrogen can cause severe frostbite and cold burns. Always handle liquid nitrogen in well-ventilated areas to prevent excessive concentrations of gas that will rapidly displace oxygen and kill people by asphyxiation. The 6th International Chick Meeting will be held at The Roslin Institute in Edinburgh, on September 17-20, 2011. The meeting is chaired by David Burt (Edinburgh Univ) and the local organizing committee includes Helen Sang (Roslin Institute), member of the ISTT. Information extracted from the meeting web page: The 1st International Chick Meeting was held in 2003 chaired by David Burt and Olivier Pourquié at Hinxton, Cambridge (UK), to mark the start of the chicken genome project. The 2nd was organized by Rob Krumlauf and Olivier Pourquié at the Stower’s Institute (USA) in 2004 to review the latest findings from the completed chicken genome sequence. This was followed by two more workshops held at Cold Spring Harbour (USA) in 2005 and 2006. The 5th international meeting was held at PRBB, Barcelona (Spain) in 2007, organized by Fernando Giraldez with more focus on the biology of the chicken exploiting new genomic resources now available for the chick. The plan this year was to hold the 6th at Tohoku University in Sendai, Japan, however due to the recent Earthquake these plans had to be cancelled. A new venue was arranged for the Roslin Institute at Edinburgh University. The 7th meeting will be arranged for Sendai in autumn 2012. 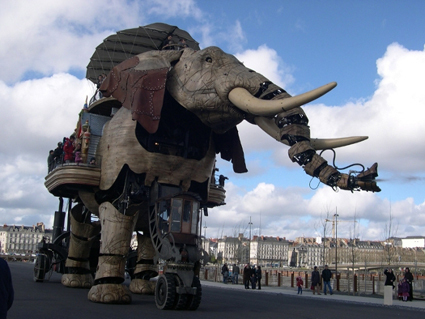 The forthcoming TT2011 meeting will be the 10th Transgenic Technology (TT) meeting organized. The first TT meeting (TT1999) was held in Stockholm, Sweden, whereas the 10th TT meeting (TT2011) will be held at TradeWinds Island Grand Resort, in St. Pete Beach, Florida, USA, on October 24-26, 2011, organized by the International Society for Trangenic Technologies (ISTT). To highlight this 10th Anniversary, we’d like to put together an “Anniversary Booklet“. In this booklet, we will be highlighting the accomplishments of not only our Society, but also the field of transgenics/knockouts/cryopreservation/mouse reproductive technologies since inception. We would be honored to include your work’s contribution to the field. who mentored you in this field? Where did you learn transgenic methods?